Caroline's rowing blog: 2016 - 2017 Season Ends today! Hey ETT'ers, just a quick reminder to you all to upload or rank your metres and work-outs as the 2016-17 season ends today. As a team we currently reside in 15th place in the world-wide affiliation rankings out of 2167 teams. We are in the top 1% of teams! 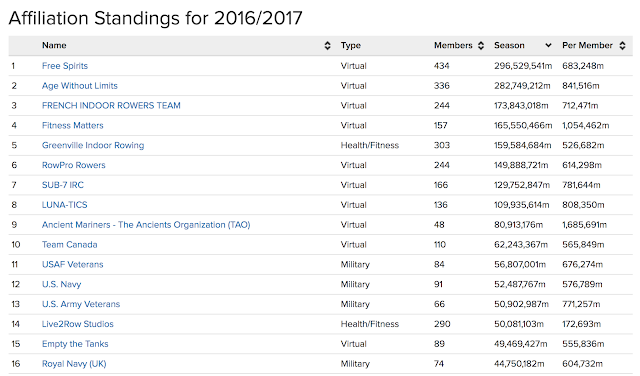 We are in the top ten of virtual teams! 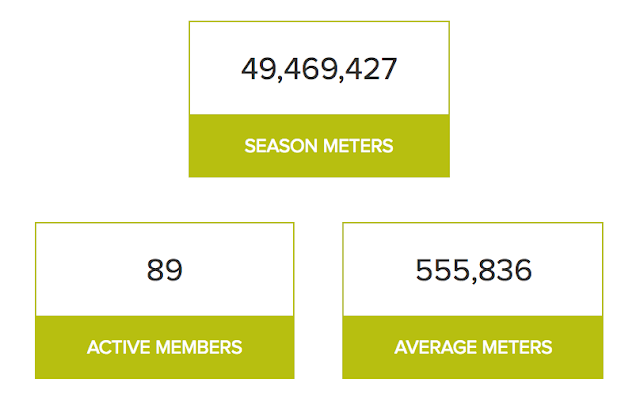 We have almost rowed 50,000,000 metres this season! Tomasz, Ken and Steve have rowed over 3 million metres! The remaining team mates contributed between 1k to 85k. Thanks to Toni, Neil, John D, John G, Epsen, Simon, Elizabeth, Barb, Mike P, Kevin, Joe C, Alison, Wayne, Daniel, Natalie, Esa, Lisa, Dave R, Michael C, Lance, Eloisa, Amelia, Jeff W and Alex S.
Excellent work team mates and all the best for the 2017-2018 season! Missed my target of 2 million last season as I had an unexpected 3 weeks away from the rower. I doubt I will be so ambitious this year though. Posted before saying an excellent effort to all the team members and as always the captain. Looking forward to the 2017-2018 season events.